Home | Push or pull e-learning? Or both? Most e-learning implementations that we have seen in SA, including those we have implemented for our own clients, have been of the “push” type, that is, the content is developed for a specific purpose, loaded on a Learning system, and “pushed” to staff for them to go through. Go there and do this….and then do the assessment so we can see if you understand the content. Compliance e-learning is a good example of this – here are our organisational policies, we need you to know about them and to confirm you have been through them and understand them…. Or here are these banking regulations you need to know about so we can comply with them and stay in business….Product training is similar, and so is systems training. In all of these cases, “push” e-learning serves its purpose. We want people to comply or to learn a predetermined and essential skill which will support the organisation. But that is not the way adults really learn is it? At least not voluntarily. As staff grows and become more senior and more experienced, they want to find out more for themselves, indeed are quite capable of doing that without going on a course. This is even more so where there is no time for training, or a lengthy training course is not what is needed. 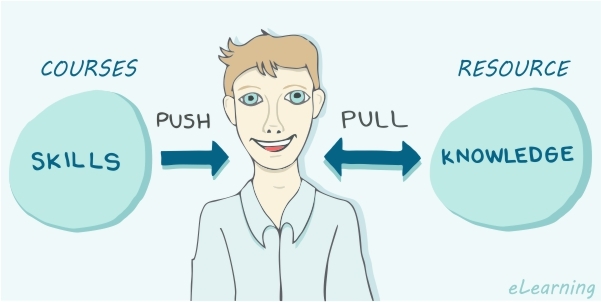 Thus while face to face courses and workshops and “Push” e-learning clearly have role to play in “programme” learning for managers, there is also a clear role for “Pull” learning, where the managers or leaders search for the content, “Pull” what they need to address a particular issue or to make a decision, and then apply it. Right then. To be able to do this, what managers need is “Just-in-time performance support” – something that has been talked about in relation to e-learning for quite a while, and which is now gaining a lot more interest internationally. Say I need to find out what the best practices are for ……………………….. I could go online and Google that, but then I would be faced with myriad resources, not necessarily in any order, and also not necessarily the best or even right resources to address my problem. Or I could ask others, but that could take a while, and maybe I want to find out for myself. That is where the “Pull” approach is really appropriate – particularly if I can have access to an up to date body of international knowledge which is easy to search and which provides me with the answers I need. Now, not tomorrow, not next month when I have been on the next available face to face course or watched a 3 hour e-learning module. If the content is good quality and the organisation can add its own content to this, local content, or content specific to the organisation itself, then the value of this online “toolkit” increases exponentially. Does traditional e-learning meet this need? Simply, no. Both “Push” and “pull” e-learning have their places, as they support usually different groups of staff, with different objectives in mind.